drawers & soft cushions up to 60 feet away! 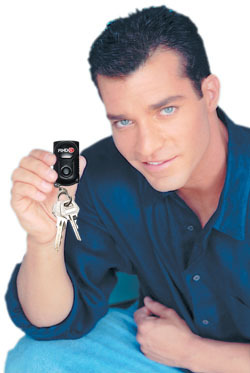 Hello, I'm Entrepreneur Craig Nabat, President of Ambitious Ideas, Inc., and inventor of the FINDIT Key Finder ®. 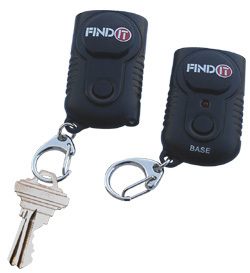 The FINDIT is the highest quality, most innovative and easy-to-use locating device on the market today. FINDIT attaches via key ring, adhesive strip, or magnets to any of your commonly lost household items such as keys, remote controls, eyeglass cases, pill boxes, makeup bags, video games, toys, canes, or anything you tend to misplace. Just Press, Listen, & FINDIT. This revolutionary device responds through walls, purses, drawers, and sofa cushions up to 60 feet away! Since 1993, I've invested $1 million to bring my original and new & improved FINDIT Key Finders ® to market for people just like me who constantly misplace their keys. On so many occasions I found myself frustrated looking for my car keys. Prior to creating the product, I thought about developing the concept daily; the process of turning an idea into a reality became an obsession for me. I've dedicated a considerable part of my life developing & marketing the FINDIT ®. At all costs personally and financially, I wanted to see my vision through. Following through on my ideas has allowed me the opportunity to develop many new innovative consumer products to make life a little easier and more enjoyable. My desire is to always inspire others with great ideas to pursue their dreams despite obstacles they may face. Another life passion of mine has been helping people quit smoking. For many years, I seriously struggled in attempting to stop smoking cigarettes. In 2001, I learned about a low-level laser therapy procedure in Canada, which finally helped me permanently end my nicotine addiction. After experiencing the procedure, I was driven to establish Freedom Laser Therapy, a quit smoking clinic, and built the company into the number one brand in the quit smoking laser therapy industry. Freedom Laser Therapy has launched an at home Freedom Quit Smoking System for smokers who want to quit. Smokers everywhere can now benefit from Freedom's unique quit smoking program which focuses on the physical and psychological addiction to nicotine.